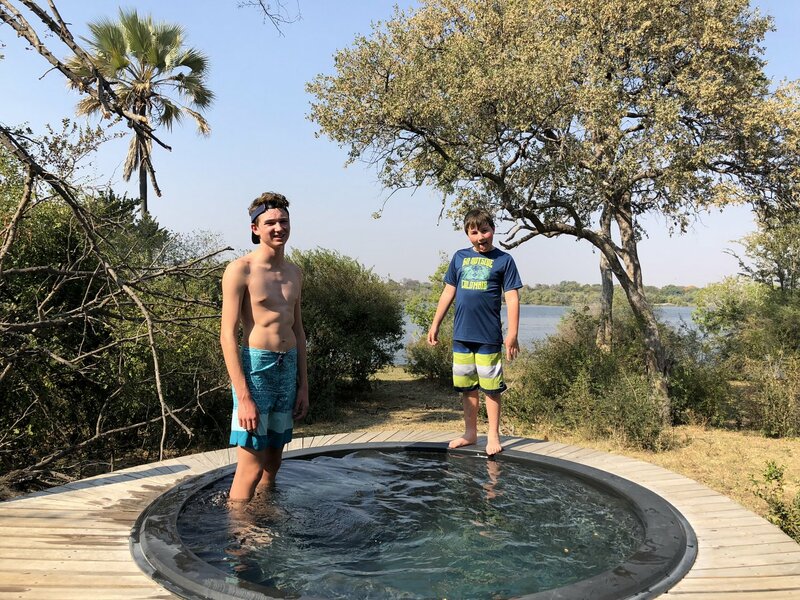 We were ready to explore Africa with our two boys, ages 16 and 9. We flew first to Europe and spent time with grandparents in both Italy and Ireland, then boarded a nonstop flight from London to Johannesburg. After landing in Johannesburg we were grateful to have 2 nights / one full day to rest and explore. On our way to the hotel, our guide told us about something called the Neighborgood market going on later that day. Its held only on Saturdays in a parking garage with food vendors from all over. The boys were excited so off we went. There was quite an amazing setup of food, music, and bars. Ben went for seafood paella, Tanner sushi, of course, I found a cappuccino, fresh juice, and ramen, Brandt opted for Dim Sum. It was fun sitting at the long communal table and meeting locals. The next day we had a full day planned with a private guide. There is so much recent history here with the story of Nelson Mandela and the end of Apartheid. We visited the Apartheid museum, and it’s very impressive. 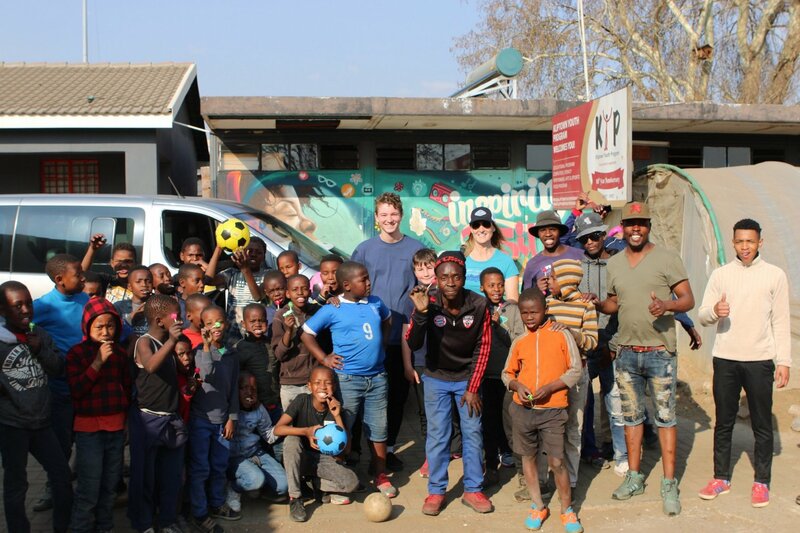 We followed it up with a visit to Soweto and a visit to Kliptown, one of the most impoverished areas in Soweto that has a youth center. We had our guide stop on our way and the boys picked out soccer balls, school supplies and treats to take to the kids. 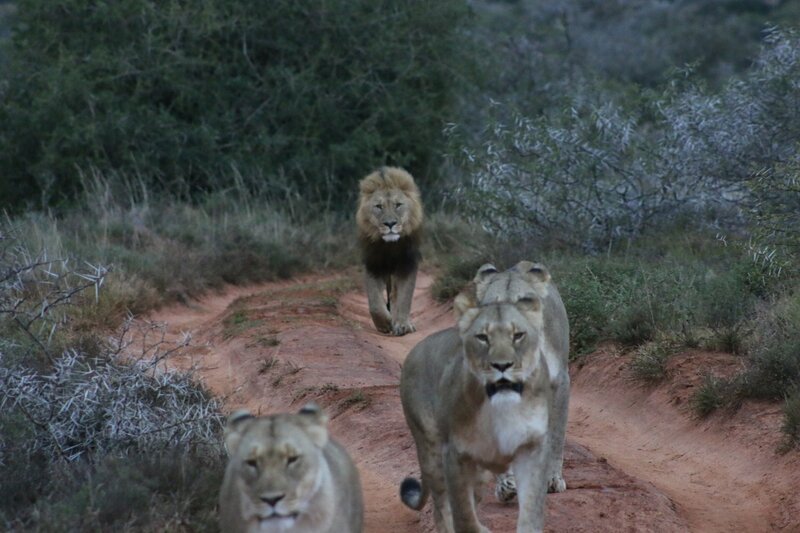 The following day we caught our flight to Port Elizabeth to start our safari on the Eastern Cape. We stayed at Amakahla Game Reserve and Hlosi Game Lodge. This is a great destination for families. You can opt for a luxury family tent or a family suite that has 2 bedrooms, 2 bathrooms, and a living room. 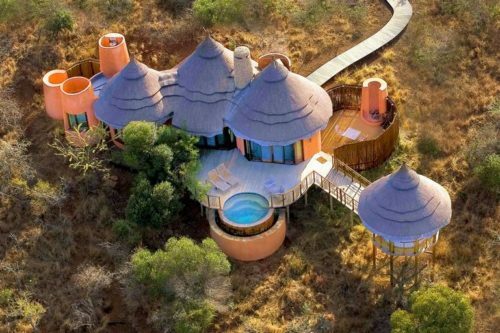 It is done up with a typical thatched roof and beautiful furniture to give it the true “Out of Africa” feel. 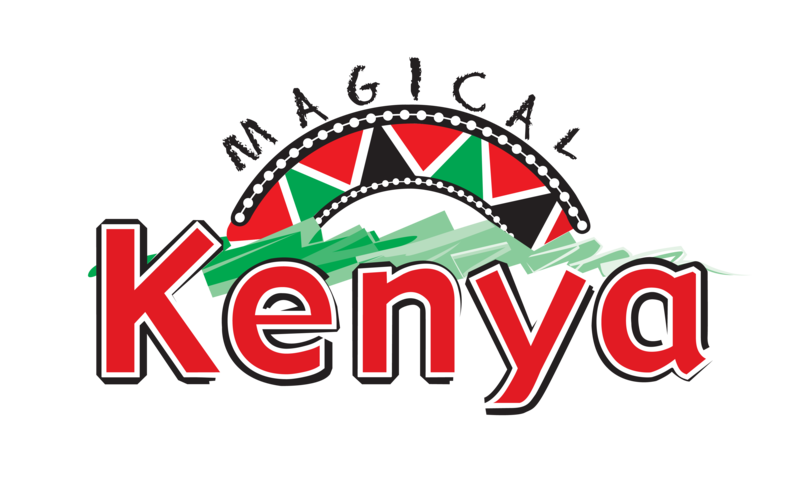 All meals, drinks and 2 daily game drives are included. The proximity to game is exciting. While sitting out on our deck we saw zebra, warthogs, and monkeys. Within 5 minutes of our first game drive, we spotted giraffes. It is great to have a short drive to view game when you have children. This is super important with kids as you don’t want an hour drive to get to where the game is. Our guide Jean Luc was very knowledgeable and taught the boys a lot about the animals we spotted. They were handed an animal guide so they could check off the animals and birds they spotted. We brought one of our older cameras with a telephoto lens so the boys could take their own photos of the animals. This was great in keeping them busy and they learned how to take photos. (If you don’t own a telephoto lens you can also rent one from your local camera store.) We were so lucky to see so many animals, including lions, rhinos, and elephants. After 3 nights it was time to say goodbye and head to Cape Town. Cape Town is a bit like San Francisco with weather, the waterfront, and great restaurants and shopping. Our first day was the must-do Cape tour. This takes all day and I recommend a private car/guide so you can go at your own pace and not worry about driving on the opposite side of the road. The road winds along the most breathtaking coastline. It includes a stop at National Park with a photo at the sign of the southeastern-most point of Africa. There is great hiking into deserted beaches and you could easily spend a whole day there. We continued from there to Simonstown, home of the famous penguin colony. After paying admission, it’s an easy stroll on the wooden walkway to the beach. 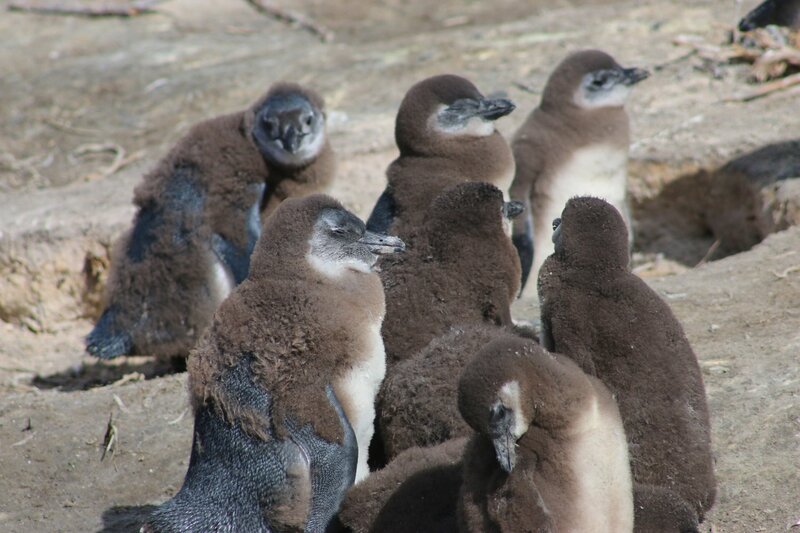 Here you can view the cute penguins and take photos without bothering them. Our next stop was Kalk Bay, a funky surf town. Great shopping and seafood restaurants line the beach. Our favorite place for grilled seafood platters is The Brass Bell Restaurant on the water. The next day was Saturday so we went to the Table Mountain Cableway first thing in the morning to avoid lines. The afternoons often get windy and they will close the cableway, so plan to go in the morning. Afterward, we headed to the Old Biscuit Mill for another Neighborgoods market. We enjoyed more food stalls and shopping. If you can be in Cape Town or Joburg on a Saturday, we highly recommend checking this fun community event! Our next adventure was a Winelands tour. This was the one tour we weren’t sure about with the boys. It’s only a 30-minute drive from Cape Town (think Napa from San Francisco), with equally amazing wine but at half the price. What do you do with kids on a wine tour? On Ryan’s recommendation (Ryan de Beer, our South African local and Sales and Marketing Director), we headed to Spier Winery. On the winery premises, they also have a bird sanctuary. There was some doubt and grumbling from the boys about having any fun at the bird sanctuary. We convinced them to go in for at least the bird show. Our guide Jean took the boys in and Brandt and I strolled to the tasting room. Brandt and I figured we had about 45 minutes before our boys would be searching us out. As we enjoyed our wine we realized an hour had passed already. We walked through the gardens over to the sanctuary. Still no sign of the boys. Inside we found them with falconry gloves holding brown eagles and petting barn owls. 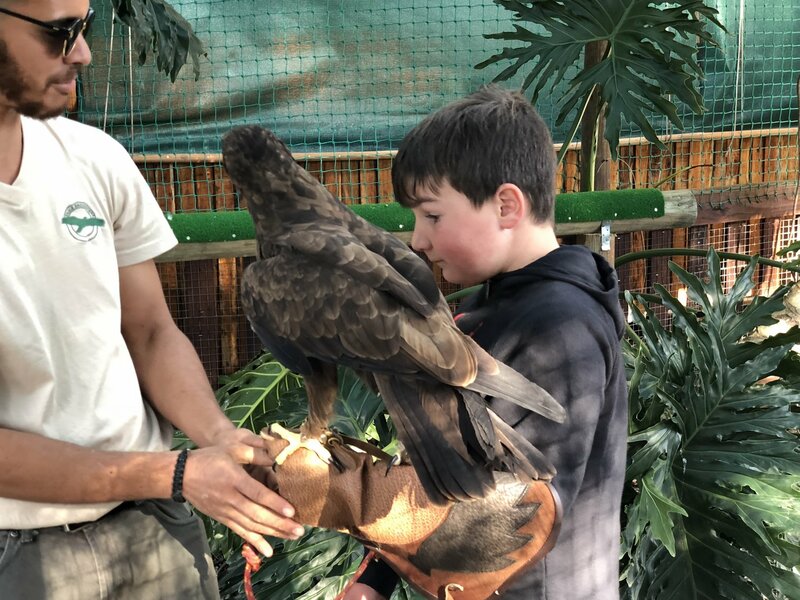 Our youngest exclaimed, “This place is awesome, let’s stay for the next bird show.” The volunteers there really educate the kids and involve them hands-on with the birds. The boys ended up staying there for an hour and it was the highlight of their trip. We sadly said goodbye to Cape Town as we flew out to Victoria Falls, Zimbabwe. We landed and were greeted by our driver. Upon leaving the airport we entered the National Game Preserve on the way to the river dock. In 20 minutes we arrived at the river dock where a pontoon boat was waiting to take us to the Victoria River Lodge. Our boat ride included crocodile and hippo sightings along the way. 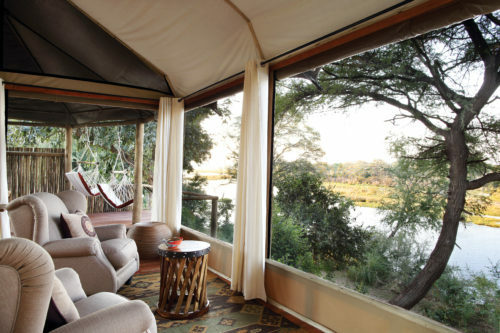 The Victoria River Lodge is a luxury tented camp perched along the river. Our family tent faced the water and had a deck with a hot tub. Inside was the main room with king bed and then the alcove with bunk beds for the boys. A beautiful bathroom with indoor/outdoor showers and claw footed tub finished out the luxurious feel. We relaxed on our deck and watched the warthogs and monkeys play beneath us. 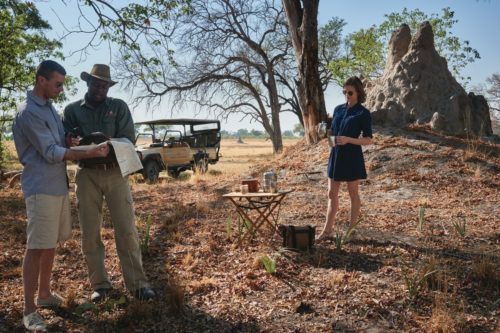 Activities such as game drives and sunset cruises are included in your stay. We opted for the 2-hour sunset cruise. Our guide, Casper, asked us our favorite drinks and had the boat bar stocked for us. We walked down to the pontoon boat at 4 pm. It’s not just a sunset cruise, it’s also a game cruise. It was the ultimate luxury to sit with a cold glass of South African Sauvignon Blanc watching the elephants come down to the water to drink. We saw so many animals along the river banks. And then when the sun was starting to set Casper made sure we had the perfect view of an unforgettable African sunset. 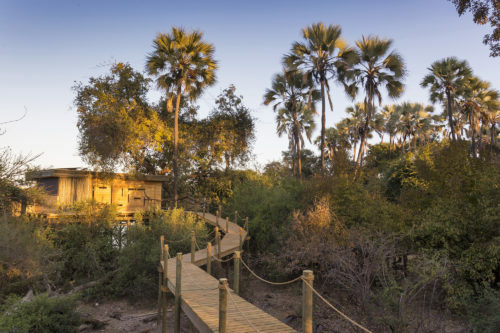 We only had 2 nights at Victoria River Lodge, and we had many activities planned. The next morning we got up early for a game drive and were thrilled with the beautiful sunrise and up close sightings of elephants and a one-week-old baby giraffe. Next, we were off to explore Victoria Falls. First, we did a 20-minute helicopter tour for a birds-eye view of the falls. This is an additional cost but well worth it. After our flight, we hiked the perimeter of the falls for an up-close look. It’s amazing to see this huge waterfall up close and to feel the spray. We finished up with some shopping at the local stalls. 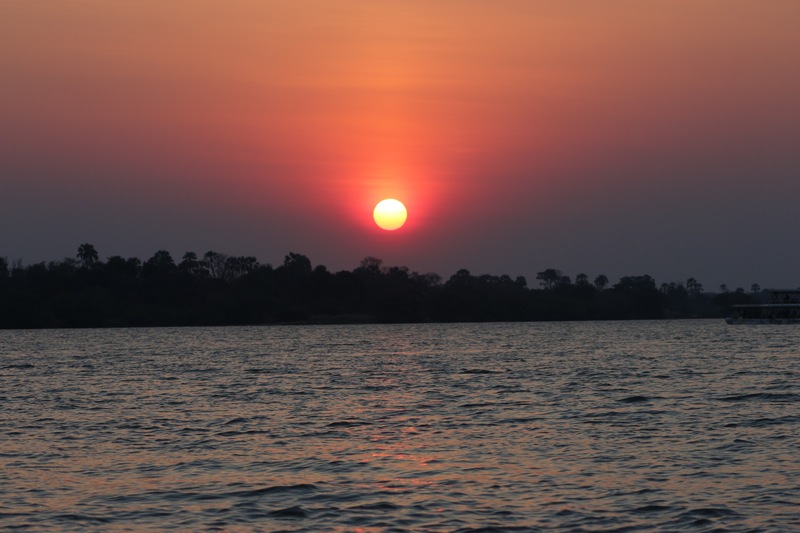 That evening we were treated with another stunning sunset and game viewing cruise. What a perfect way to spend our last evening in Africa. We were sad to leave the next morning and vowed to return soon. Our trip to South Africa was magical. And don’t tell our boys but it was actually educational. They were exposed to different cultures and people outside of what they know in the U.S. The boys declared it their favorite trip ever. It is truly a perfect family vacation. With the US dollar so strong against the South African rand, it is more affordable than people think. Many people think they need to save it for retirement. 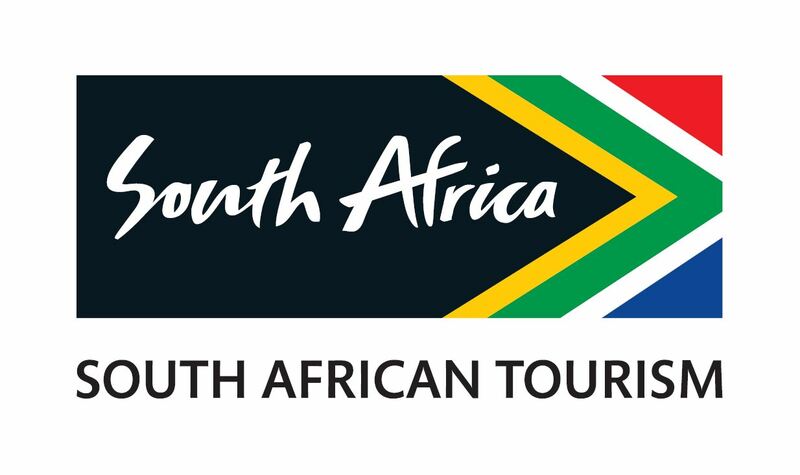 But for the same price you spend on taking the family to Hawaii or Europe, you can take them to South Africa. Put it on your list—you’ll come home with memories for a lifetime! 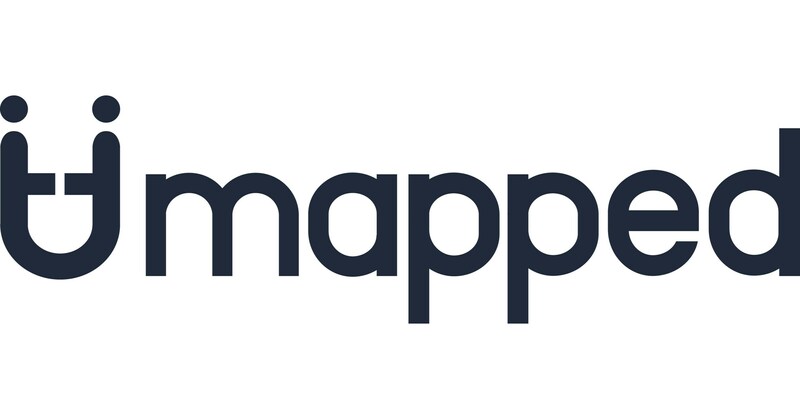 Tips: Find a knowledgeable travel professional. Thank you Ryan de Beer at Adventures Africa. This is key for the best prices and a flawless itinerary.Consider a stopover in Europe on the way. It breaks up the trip and lets your system get on Africa time.Ask to book guides there who enjoy kids. Keep your kids active! Include their interests in the activities. My kids aren’t thrilled with museums, but sports and world cup soccer stadiums were high on their list. They also love trying new types of food, so we made sure to visit many food markets, and all were delicious. Talk to your kids about what they want to see when you are planning the itinerary. Take binoculars and cameras for the kids. The cameras keep them busy on game drives. 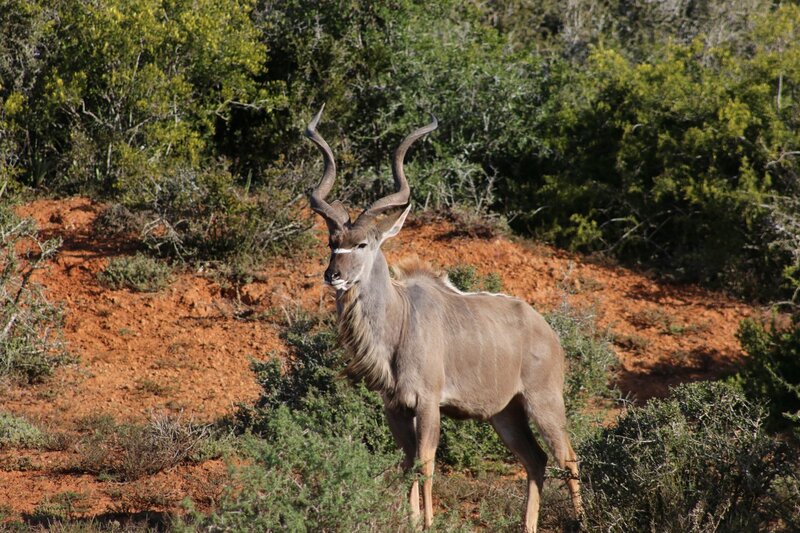 Consider renting or buying a telephoto lens for the safari. Movies: Invictus – Great for sports enthusiasts and also gives some history of the country. Books: Nate and Shea’s Adventure’s in South Africa, for young readers. Any age-appropriate book on Nelson and Winnie Mandela is essential. Long Walk to Water, by Linda Sue Park. For both teenagers and adults. Born a Crime, by Trevor Noah. Great book for both teenagers and adults.